Jack Sparrow may have said “But why is the rum gone?” and until recently we would have wholeheartedly disagreed with him. We have never been overly fond of rum (Lesson: do not make Zombies) and for us the saying was always “But why isn’t the rum gone?”. 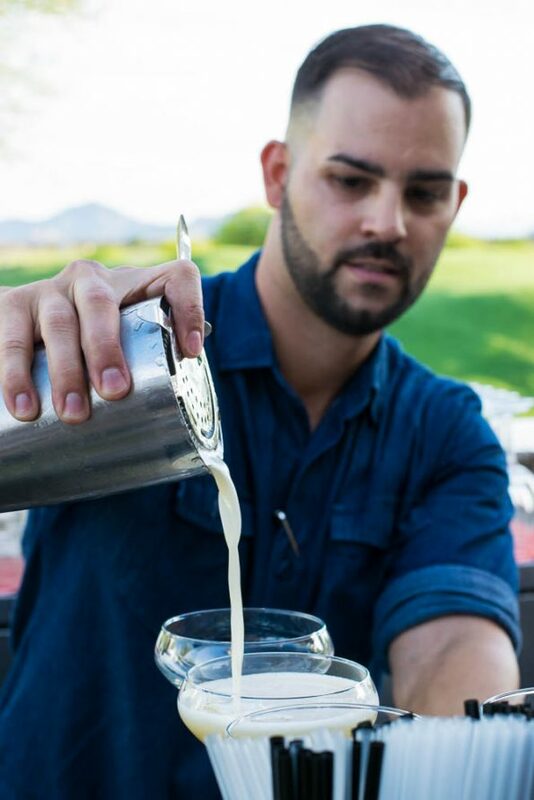 This changed after our recent dining experience at Chef Richard Sandoval’s newest concept, Toro Latin Restaurant and Rum Bar at the Fairmont Scottsdale Princess. The Pan-Latin menu at Toro combines South and Central American flavors with ingredients rooted in the Japanese and Chinese Peruvian cultures. 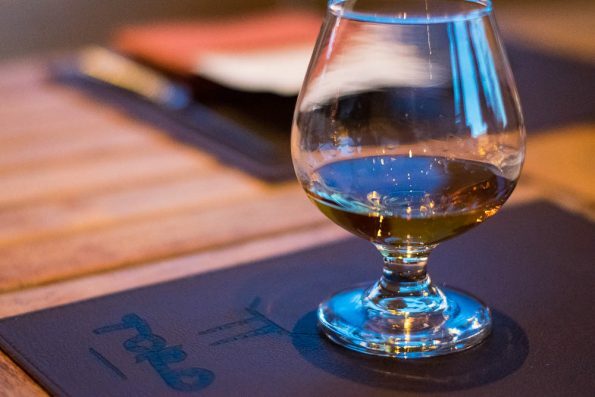 Toro offers over 151 different rums, which is the largest selection in the Valley. 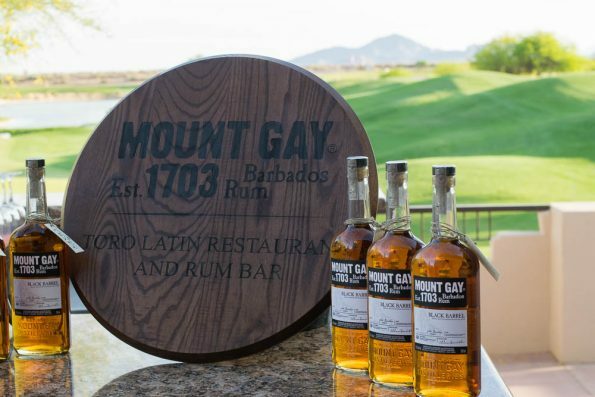 We were recently invited to the Sip and Savor Series Rum Dinner featuring Chef Richard Sandoval himself, Executive Chef Forest Hamrick, and rum pairings by Toro’s Rum Princesa Caitlin Kreider. We started the evening with happy hour on the patio. If you haven’t been to Toro, which is located in the TPC Scottsdale Clubhouse, you are missing one of the most spectacular views in Scottsdale. While we absorbed our gorgeous setting we were treated to a traditional style daiquiri featuring Mount Gay Rum and various appetizers including ham and cheese croquettes, black bean filled gorditas, empandas and even sushi! All of the appetizers were not only packed full of flavor, but were also so beautiful that it was almost difficult to eat them (almost…). The first cocktail was also the first (and certainly not the last) time we questioned our disdain for rum. We asked ourselves if perhaps our discrimination was unfounded or if this rum was maybe a fluke. As the sun set we were seated on the patio for dinner (one of the many benefits of springtime in the valley). Our first course was the Tuna Nikkei Ceviche paired with Ron Matusalem Gran Reserva rum. The Tuna Nikkei Ceviche features tuna, white soy, avocado, nori, and sesame. It was very reminiscent of an ahi poke and prepared perfectly. Each bite felt like a curated oceanic journey with creamy avocado pit stops. When paired with the Ron Matusalem Gran Reserva, the salty and briny flavor of the ceviche was enhanced beautifully by the sweeter nature of the rum. The next course we were treated to was Grilled Avocado paired with Rhum Clement V.S.O.P. When one thinks of a grilled avocado, you might not expect to be served something so packed full of flavor. 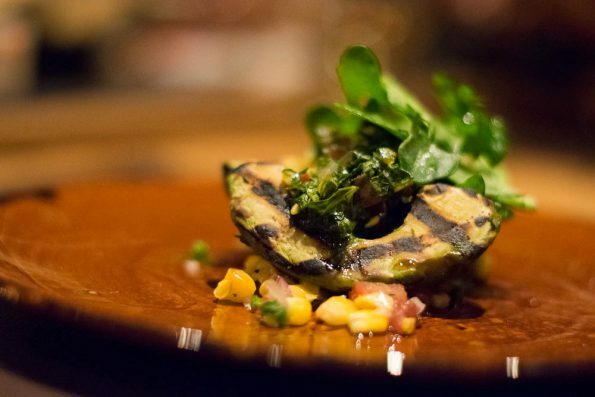 Avocados are typically awesome on their own but Toro takes grilled avocado to the next level. Served with sweet corn, pico de gallo and some sort of gremolata. The creamy and salty delight along with the sweet corn makes for a flavor explosion that will astound you. You’d never think that a grilled avocado could be escalated to this level. The Rhum Clement V.S.O.P. had characteristics similar to a scotch and the flavors of the grilled avocado toned it down and made it quite enjoyable. For our entree course we were served Chinese Braised Beef Short Ribs paired with Brugal Rum 1888. 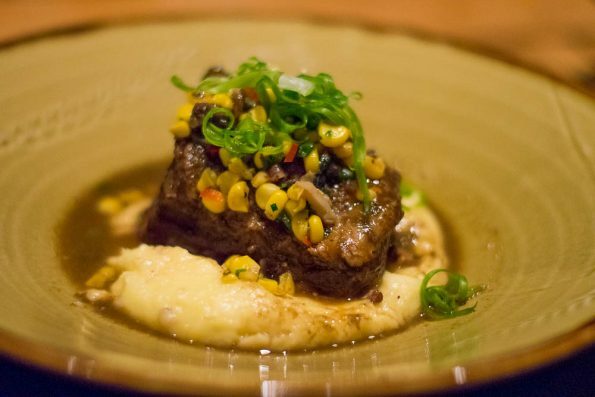 The short ribs are served with Manchego mashed potatoes, mushrooms, corn salsa and dragon sauce. This entree proved that when done correctly, rich flavors paired with other rich flavors can be great rather than overwhelming. The bourbon characteristics of Brugal Rum 1888 paired with the Chinese Five Spice flavors in the short ribs was mind blowing! Follow that up with the manchego mashed potatoes (come on, who doesn’t love potatoes and cheese?!) and it doesn’t get much better than that. We finished our meal with not one but two desserts paired with Zaya 12 Year Rum. The first was La Bomba, which were brought out by the entire staff. Each table has plastic or parchment paper sheets set on them and in synchronized perfection the staff dropped molded chocolate bowls filled with gelato, fresh fruit and edible flowers on our tables creating delightful and whimsical explosion of dessert. The explosions were marked with all of us yelling “La Bomba”! 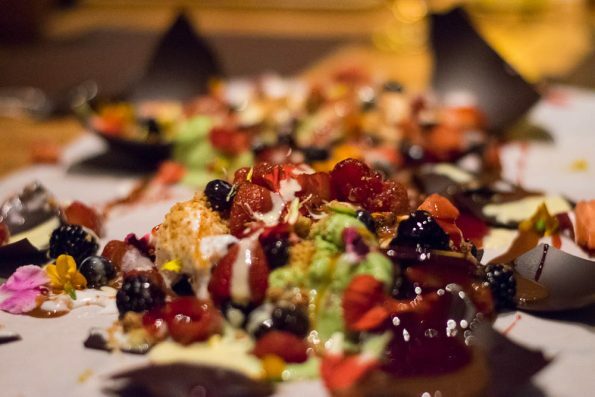 Not only is La Bomba a fun and interactive experience but it also tastes incredible! If that wasn’t enough, we were also served Chocolate Tres Leches Cake! Both desserts were decadent and paired extremely well with the Zaya 12 Year Rum which was the sweetest of the rums served during the evening. Our experience at Toro was certainly eye opening. Now rather than asking why the rum isn’t gone, we are starting to see what Jack Sparrow was talking about. Maybe he just really wanted some Brugal 1888! The next Sip and Savor Series event will be in May. So get your Derby Hat on and check it out! *The Geeks were given comped tickets to this event in order to facilitate this write-up; opinions are wholly our own. View our Disclosure Policy for more info. Thank You so much for joining us that evening. It was so much fun and I’m so glad you got a chance to experience all of our wonderful flavors from the food to the rum. It was great meeting you two! Can’t wait to see you again!